From all over Europe, seven female and seven male coaches, all aged 33 or younger, gathered in the city of Szczyrk in the south of Poland in June for the 2018 EHF Young Coaches Workshop. With the hosting federation, Poland, adding two more participants, a total of 16 coaches attended the six-day seminar. They all had basic education and experience in handball coaching coming into the workshop. In the theoretical part of the workshop, six EHF lecturers gave presentations about various technical, tactical and mental aspects of the game. In the practical part, each coach presented two training sessions - one had been prepared in advance, one during the workshop. During the sessions, they were assisted by two Polish junior national teams. After their training sessions, the coaches received individual as well as collective feedback from the EHF lecturers. The sessions were evaluated based on content and realisation, while topics like soft skills and communications with the team were also addressed. 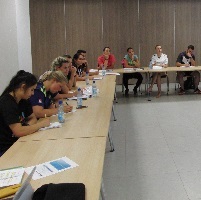 The seminar was the fifth Young Coaches Workshop organised by the EHF Methods Commission, which focuses on development, (further) education, and training as its core activities.